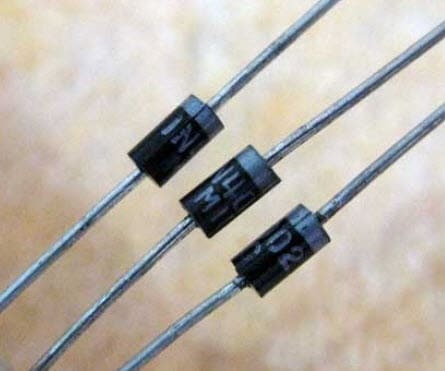 Zener diode is a special kind of diode which permits the flow of current in the forward direction as well as in reverse direction when the voltage is above a certain voltage known as breakdown or Zener voltage. In our previous articles, we explain in detail about diodes, PN junction diode, semiconductors etc. In this article, we are going to explain Zener diode and its applications in detail. It is one of the most demandable electronic component used to generate low power stabilized supply rails from a higher voltage and to provide reference voltages for the circuit. It was named after the Clarance Melvin Zener who discovered the Zener effect. Zener diode also known as breakdown diode is made up of silicon PN junction. When we forward biased the Zener diode, it behaves just like a normal signal diode due to 0.7 V forward voltage drop which follows the diode equation. In reverse bias mode, Zener diode do not conduct until the applied voltage exceeds or reaches a certain voltage i.e. Zener voltage at which the diode is able to conduct current up to the specified level without harming the device. Due to avalanche breakdown, a conventional diode is subject to high current when the reverse bias breakdown voltage is exceeded. For safety precautions this current is limited by the circuitry otherwise, it may damage the diode due to overheating. When the current starts flowing through the diode, it increases rapidly to the maximum circuit value and once this current achieved it will remain constant over a wide range of applied voltages. The voltage point at which voltage across the Zener diode becomes stable is known as Zener voltage which varies from less than one volts to hundred volts. The above diagram shows the V-I characteristics of the Zener diode. By connecting the negative terminal of the battery to the diode anode terminal, zener diode starts operating in the reverse bias or breakdown mode. With the sufficiently applied reverse voltage, p-n junction experience a rapid avalanche breakdown and starts conduct current in the reverse direction. When we applied an electric field across the diode, then the free electrons start moving across the diode and got collide with the other free electrons. These collisions quickly become an avalanche. 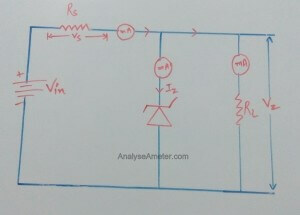 When this process is going on, then a small change in voltage will cause a large change in current. Zener diode can be formed by changing the thickness of the layer to which the voltage is applied because the breakdown process depends upon the applied electric field. The ability of diode to control itself can be used to stabilize the voltage source against supply or load variations. 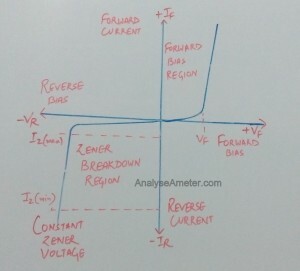 In the breakdown region, the voltage across the diode is almost constant which makes it use it as a voltage regulator. The main purpose of the voltage regulator is to maintain a constant voltage across a load irrespective of the variations in the applied input voltage and load current. Under varying load current conditions, Zener diode can be used to produce a stabilized voltage output. 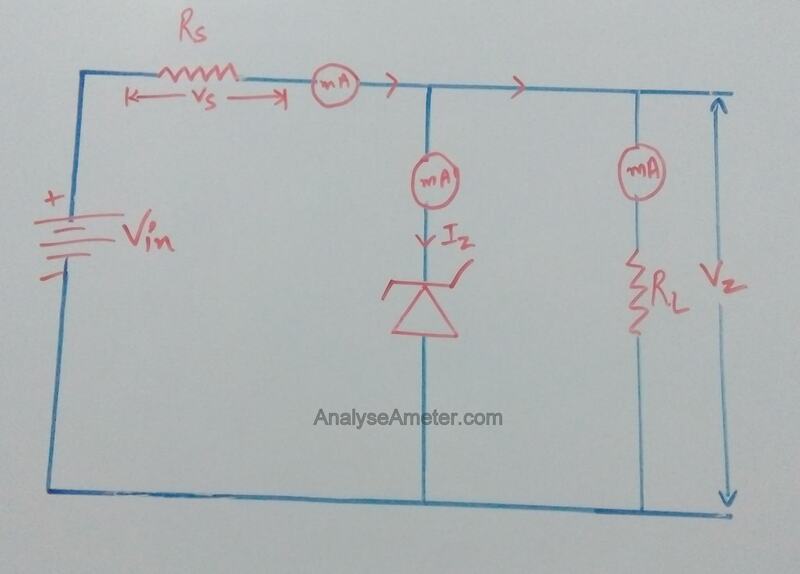 This is the main reason behind using Zener diode as a voltage Regulator. As shown in the figure above, the resistor is selected so that when the input voltage (Vin) is minimum and the load current (IL) is maximum than the current through the Zener diode is, at least, minimum (Iz). When the load current is the highest the Zener conducts the least current while at lowest load current it conducts the most current. For working in reverse bias mode, the positive terminal of the battery is connected to the cathode side of the diode. With no load connected to the circuit i.e. IL = 0, the whole current will pass through the diode which in turn dissipates its maximum power and can be used as a shunt regulators. 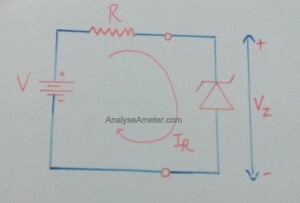 When the load is connected in parallel to the Zener diode, the voltage across RL is always same as the Zener voltage i.e. VR= VZ. 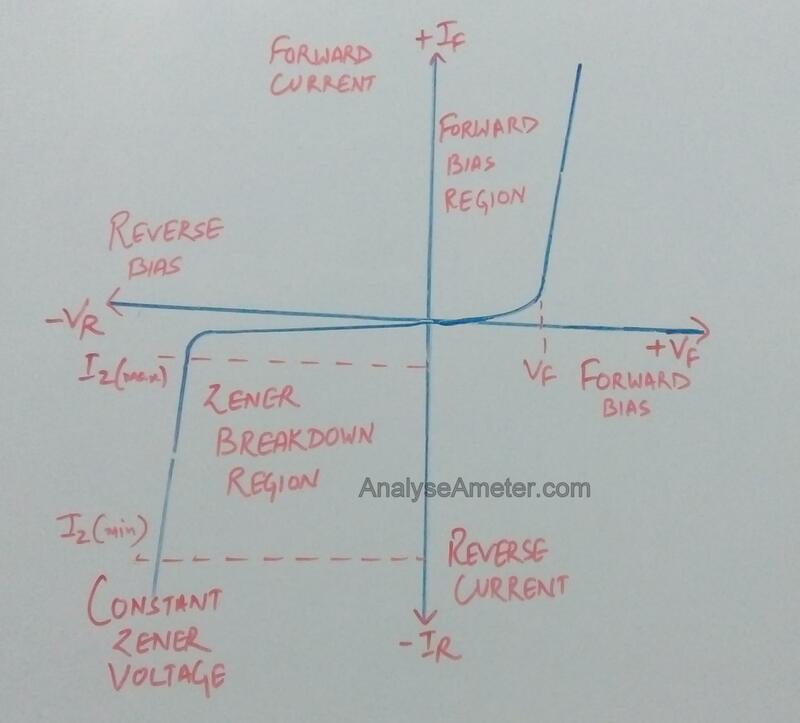 As long as the current remain in the breakdown region, the voltage across the Zener will remain steady at its breakdown voltage for all the values of Zener current. The upper limit of the current is dependant upon the power rating of the device and the supply voltage VS must be always greater than the Zener voltage VZ. In this type of regulation, the input voltage is fixed and the load resistance is varying. As long as the load resistance is maintained above a minimum value, the output voltage remains same. The percentage of load regulation is defined as the ratio of the difference between the null load voltage and full load voltage to the no-load voltage. Where VNL is the null load voltage and VFL is the full load voltage. In this type of regulation, series resistance and load resistance are fixed, the only input voltage is changing. As long as the input voltage is maintained above a minimum value the output voltage remains same. The percentage of line regulation is defined as the ratio of the rate of change of output voltage V0 to the rate of change of input voltage Vin. Where ∆ V0 is the change in the output voltage for the particular change in the input voltage ∆ Vin. Note: When selected the Zener diode be sure that its maximum power rating will not exceed i.e. 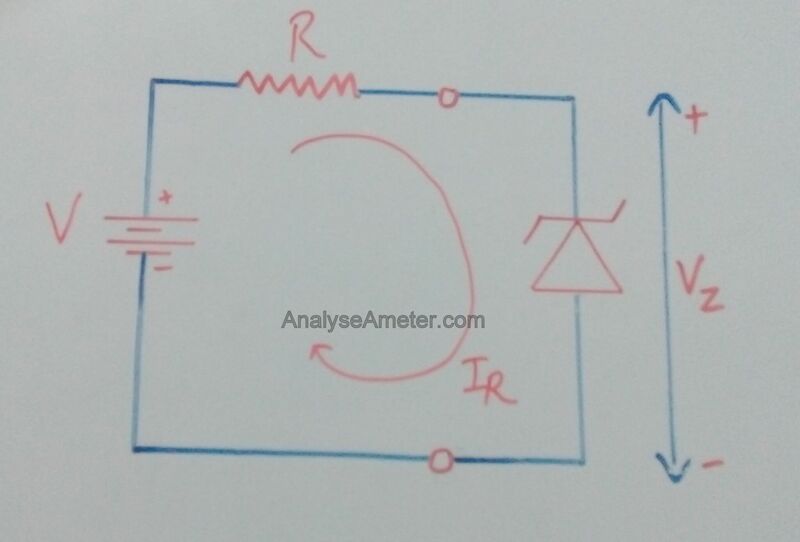 The following formulas for the calculation of current and voltage across the diode are described below. It can be used to regulate and stabilize the voltage in a circuit. These are less expensive than other diodes. It can be used in smaller circuits that would not work with any larger form of current regulation. These diodes have high-performance standard. They are compatible with most systems due to their lower cost and greater control.